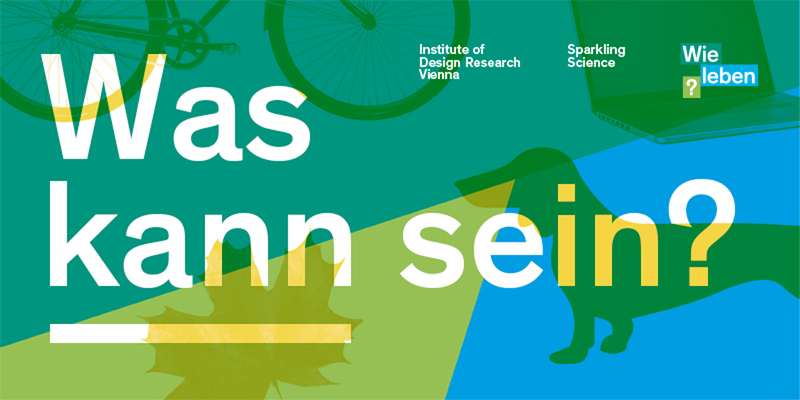 Institute of Design Research Vienna – Wie leben? How Should We Live? A Project Investigating Sustainable Lifestyles. See the project page / Zur Projektseite (DE) – The site is available in german only. How should we live? The Global Footprint shows that we are already consuming the capacity of 1 1/2 Earths. The way we currently live is therefore no longer sustainable. The ambitious goal is to reduce our CO2 footprint by 80% before 2050; this may be possible through the combination of technical innovations and behavioral changes. What should sustainable lifestyle scenarios look like in order to gain acceptance? Based on the living habits of the students at the partner schools, evaluated scientifically, designs for a more sustainable life will be created in an experimental way, sending out signals of optimism. Underlying this is an expanded design concept, one that moves away from specialization and toward improvisation; away from concrete solutions to problems and toward the demonstration of new possibilities. In the first phase, a scenario is outlined with the students that can represent Viennese/European young people and their families for the week. The assembled lifestyle building blocks are arranged using visual mapping and evaluated in terms of their environmental impact. The young researchers then investigate the real products, product-service offerings or initiatives that will help to make these lifestyles more sustainable. The “puzzle pieces” that are discovered are added to the original mappings, varied and optimized. In a further step, a participatory co-design process is initiated in which the young co-researchers become co-designers! Moderated by the IDRV, the “non-designers” will work with selected designers on a specific “intervention”. The goal is a bottom-up approach, which can be seen as an example of the respective core change area for a socially and environmentally sustainable future. “What is” is transformed into “what can be”. The young researchers will develop the fundamental skills to think for themselves and empower themselves. For the presenting Institute of Design Research Vienna (IDRV) this project is the logical continuation of its activities on the subject of “Design for Sustainability” over the past four years.